This month’s AIPR Blog post was written by Dominique Fraser, a current post-graduate student at the University of Queensland in Brisbane, Australia. Her Honours thesis examines peacekeeping in Africa and the relationship between the African Union and the UN. Her research interests also include mass atrocity crime prevention and the Responsibility to Protect (R2P). In previous blog posts for AIPR, Ms. Fraser analyzed the ongoing turmoil in the Central African Republic and the impact of UNAMID in Darfur. Today, she looks at the myriad of protection challenges facing Myanmar and opportunities for the international community to assist this transitioning country within the framework of R2P’s Pillar II. Myanmar is in a period of transition from a political dictatorship to a more inclusive democracy. From a mass atrocities prevention perspective, this change is positive: states that are less transparent are more likely to commit genocide, crimes against humanity, ethnic cleansing and war crimes—acts collectively known as atrocity crimes. However, countries that are in transition are particularly vulnerable to the commission of these crimes. During transitions, ‘the old fault lines of ethnic conflict come to the fore again and tensions increase and lead to violence.’ Myanmar currently faces several such challenges, including ‘communal problems in Rakhine State, conflicts in the Kachin, Kayin and Shan states, religious discrimination, and protest control.’ These may lead to the (continued) commission of mass atrocity crimes if the international community does not assist Myanmar to protect its population. The western Rakhine state continues to see inter-communal conflict and internal population displacements of the local Muslim Rohingya population. The government of Myanmar explicitly denies the existence of the Rohingya ethnicity, instead stating that they are of Bengali descent and therefore not citizens of Myanmar. Rohingya are subject to arbitrary arrest, detention and harassment. To date, ‘at least 200 Rohingyas have been killed and perhaps 140,000 mostly Rohingyas displaced’. Former UN special rapporteur, Tomás Ojea Quintana, has said that violence against the Rohingya could amount to crimes against humanity. These tensions may escalate with the upcoming elections tentatively set for November this year. While during the 2010 election, many Rohingya were given so-called ‘white cards’ that allowed them to vote, officials have indicated that these cards may not be renewed when they expire on March 31, 2015. This would mean that the Rohingya might not be allowed to vote. Similar accounts emerge from Kayin, a southeastern state bordering Thailand, where scores of civilians were displaced during fighting between the army and armed ethnic groups in September 2014. In the province of Kokang in Shan state, which borders the Chinese province of Yunnan, the government declared a state of emergency in response to the conflict that began on February 9, 2015. Kokang is almost completely cut off from aid groups. As such, there are no official figures on the civilian death toll, but China warned on March 10 of increased clashes between the national army and rebel forces. The conflict recently spilled over into China, killing five people. 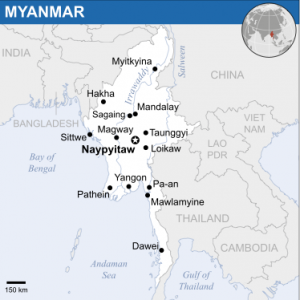 Finally, the Myanmar police have violently cracked down on several student protests. Since January 2015, thousands of students have been marching against Burma’s new national education law, which they believe will curb academic freedom. One of the largest of these protests took place in the city of Letpadan, 90km north of Myanmar’s largest city Rangoon. On March 10, EU-trained police engaged in a violent crackdown, beating not only the protesters but also attacking medical personnel caring for the injured. At least 127 protesters, mostly students, but also monks and journalists, were arrested. The previous week, student protesters in Rangoon were violently dispersed with the help of plainclothes militia. Use of such militia is lawful under Section 128 of the Code of Criminal Procedure, a colonial-era statute that allows the police to call upon these groups to control ‘unlawful assemblies.’ These developments have raised questions of how different the Thein Sein government really is from the military regime and whether this intolerance of dissent will grow as Myanmar approaches elections. The international community has a responsibility to assist Myanmar in this period of transition in order to avoid the further commission of mass atrocity crimes. The most recent UN Secretary General’s report on the Responsibility to Protect, published in July 2014, focuses on this assistance responsibility (Pillar II of the Responsibility to Protect or R2P). The report outlines three possible forms such assistance can take: encouragement, capacity-building and protection assistance. The international community must remind the government of its primary responsibility to protect the population, which includes the Rohingya. This is especially important as Pillar II rests on Myanmar’s willingness to accept assistance. 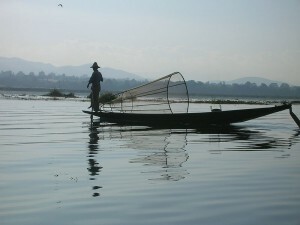 The Myanmar government wants to continue its economic reform, which goes hand-in-hand with political reform. Western pressure has helped bring along the current political reforms in Myanmar, says Jean-Marie Guéhenno, and these states should now ensure that this is continued peacefully by encouraging Myanmar to accept support for its protection responsibilities, including capacity building and direct protection assistance. The international community should help Myanmar build its capacity to protect the population. In this regard, it is especially important to address the limited capacity of the security forces, both the army and police, to deal with armed conflict and peaceful protests. The army needs to be trained so as to avoid the commission of war crimes in the states of Kachin, Kayin and Shan. 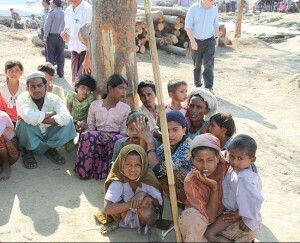 They also need to be aided to deal with the violence against Rohingya in Rakhine state. The EU needs to take responsibility for furthering the training of police to deal with protesters in a non-violent way. The international community can directly assist the government to protect its population. Refugees in China’s Yunnan states, who fled from the conflict in Kokang, must be adequately protected. The international community may also engage in increased human rights and election monitoring. It is vital that the upcoming elections be conducted in a manner that is free, transparent and inclusive. Importantly, they will need to be perceived as such by the population. Lastly, ASEAN has a role to play in these Pillar II assistance responsibilities of the R2P. As the Report of the High Level Advisory Panel on Responsibility to Protect in Southeast Asia from September 2014 states: ‘Mainstreaming the Responsibility to Protect in Southeast Asia could make a significant contribution to the establishment of a “sharing and caring” ASEAN Community, which the Association’s Member States aspire to achieve in 2015.’ Myanmar may indeed be ASEAN’s biggest test case on the road to a caring Southeast Asian community. This entry was posted in Guest Preventer, Policy for GenPrev and tagged Myanmar, R2P, Rohingya on March 18, 2015 by admin.